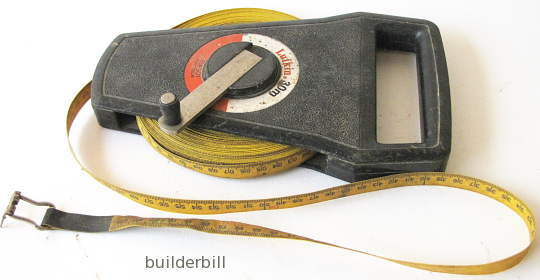 A wind up type of builder\'s long tape measure. Comes in various lengths up to 50M. A Lufkin 30M fibreglass tape. The main advantage of fiberglass in this type of measure is it's robustness and freedom from breakage. It can get twisted around obstructions and still not break. They come in lengths up to around 50M. They can be hand in Metric, Imperial and both with a different face on each side. They have the drawback of being not as accurate as the steel tapes. They do stretch when pulled very tight. That being said the tape in the photo has been used to set out dozens of house sized jobs over its life of about 15 years. In that time I guess I would have otherwise had to buy at least one steel tape every year as steel is prone to splitting and kinking. The trick with these tapes is to know their limitations and use them to quickly get within 5mm to 10mm (in the 30M) and then check the set out again with other metal tapes. This way you save damaging expensive metal tape measures.